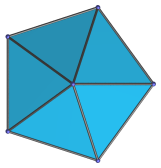 The pentagonal bipyramid is the 13th Johnson solid (J13). It has 7 vertices and 10 faces (10 equilateral triangles). The pentagonal bipyramid can be constructed by attaching two pentagonal pyramids to each other at their bases. Last updated 09 Apr 2018.